An aesthetic crag in a tranquil location, with some sustained climbs worthy of classical status. face. A set or two of wires and a range of cams is recommended for the few trad routes. From the east side of the nose, left to right. 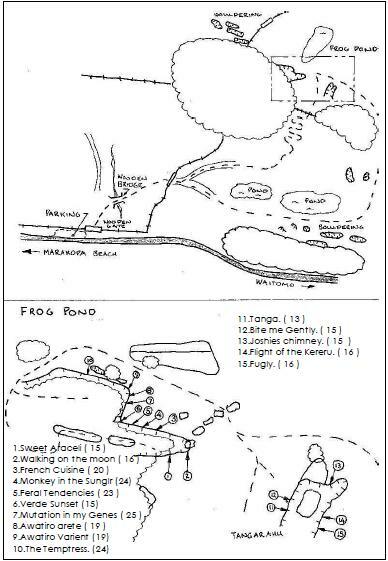 Frog Pond is on the property of the Stubbs family, and is currently leased out to Greg Scott. Ann or Alister Stubs (07) 878 8594. Josh Taylor, John Newby, Lester Moore, Sept. ‘99. John Newby, Kieran McKay, Sept. ‘99. Start directly under the nose and up to the vertical finger crack. Around arete to the deep crack systems on the main face until they disappear and then traverse right along the hand crack to the large groove. Run out to the top of ‘WOTM’. John Newby, Josh Taylor Sept. ‘99. The ominous eight bolt route on the right of the main face. Destined to be a classic. The name rings true, as much for the nature of some particular moves, as it does for the lifestyle choice of the time. Ringbolt belay. John Newby. Feb, ‘01. At the fourth bolt of Feral Tendencies(23+), instead of stepping up and right to the finger crack. Brave the naked face directly into the orange orifice. On the lower face of the main buttress are some good quality bolted routes up to 15m high. From the corner right of Feral Tendencies. Super chimney. It was once a mossy nightmare. Left of the arete. Climb up to the slopers tending right towards the arete, then back to centre face. Very sustained. 6 bolts. Ringbolt belay. Awatiro arete ( 19 ) Boulder up to first clip, to arete and face. A good route with a variety of moves. 3 bolts. Shares same belay as ‘MIMG’. John Newby, Josh Taylor, Mar. ‘00. Technical crack to start, to sharp sloping crux, to long pumpy finish. 5 bolts. Left of the Frog pond is a small face, Tanga rahu Rock. Bolt belays and ridiculously easy access to the top. The crack/chimney on the right (uphill side). A comfortably pleasant natural lead. Josh Taylor, John Newby, Sept. ‘99. Face climb left of Tanga. A wee bite to start with, leads to some nice gentle climbing. Three bolts. John Newby, Josh Taylor, Sept. ‘99. On the back of Tanga Rahu are two bolted lines. Climb the centre line over two bolts for a balancey start, a juggy middle, then think again for the top. John Newby, Josh Taylor, Oct. ‘99. Right of the Kereru is a three bolt climb with a face start to hand smears on the arete. On the North end is a discreet wide chimney. Stretch your way across and up, stepping right at the top onto the arete and face. 5 bolts. Josh Taylor, Cleaned and Soloed. Mar. ‘00.